Spotify has something called "Discover Weekly" that has breathed new life into my musical experience. It's a two-hour playlist, refreshed every Monday morning, that consists of music recommendations based on the artists and songs you're listening to currently. I've been using it since it was released in July, and it has honestly not disappointed me. In fact, I've found lots of new artists that I now listen to regularly, including the band We Were Promised Jetpacks. 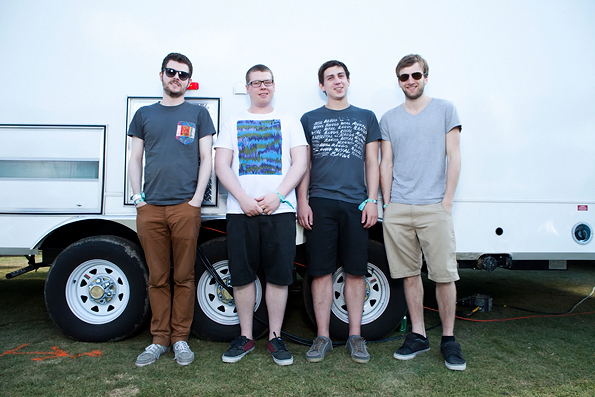 We Were Promised Jetpacks, or WWPJ, is an indie rock/punk band out of Scotland, with three studio albums (and one live in concert album) to their credit. The WWPJ song that appeared on my "Discover Weekly" playlist and started my musical love affair with them was the live version of"Quiet Little Voices" from their album "E Rey (Live in Philadelphia)." The song builds so incredibly well, increasing in both tempo and passion. It starts out very quiet, with just one guitar, and slowly the rest of the band joins in. It steadily gets louder, it gets faster, and eventually you're in a one-person mosh pit at your desk (which your co-workers totally won't judge you for). "Quiet Little Voices" was all I needed to become interested in WWPJ, and the more I have listened to them, the more enamored I have become. The newest WWPJ album, "Unraveling," is the most impressive of their work. Every song is strong and can stand on its own, but if you're playing the album straight through, you're going to have a dramatic experience. The tone of each song, both lyrically and instrumentally, is dark and heavy. The sound itself is akin to a hybrid of Franz Ferdinand and Pinback - two bands I'm extraordinarily fond of and also can't listen to enough. WWPJ lead singer Adam Thompson's Scottish accent is crystal clear in each song; accents aren't usually so easily discerned in singers, but the fact that his stands out makes WWPJ's sound all the more exceptional. Three songs from "Unraveling" that I highly recommend - although all of them are excellent - are "Peaks and Troughs," "I Keep it Composed," and "Night Terror." Have you listened to WWPJ, Hipsters? Let me know your thoughts on them in the comments section below! Wow. Took you advice and checked them out. I found my way through a few random tracks to the live version of Quiet Little Voices, and it's nothing short of compelling; raucous, stirring and thoughtfully worded and performed. I see a new band in my future, and who knows, this may be my gateway into live albums; something I've always been intrigued by, and sampled, but never really loved. Thanks for sharing! Deacon, "raucous" is the perfect word to describe that song - I just couldn't think of that term when I wrote the post! I'm really happy you enjoyed it. Live albums didn't used to appeal to me, but that's changing as I actually see more artists live. Have fun! Ed, I checked out my "Year in Music" last week. It was interesting to go back and see what I'd listened to all year, and the fact that they split it up by seasons was really cool! I'm going to try this out, usually I'm too lazy to find new songs so this seems perfect for me! Amy, I use it ever single week, and I always find a new favorite or two from the list. Enjoy!